Cryptophilus integer, copyright Udo Schmidt. 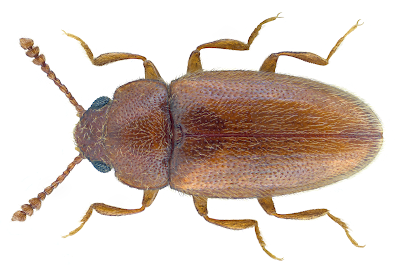 The Cryptophilinae are a group of saprophagous or mycophagous beetles mostly found amongst leaf litter (Leschen 2003). Characters (from Leschen 2003): Mandible usually with subapical serrations; lacinia with one or no lacinial spines; mentum lacking lateral pockets, usually with medial carina; apical labial palpomere as wide as or wider than long, usually not securiform; ligular membrane as wide or wider than prementum; transverse gular line usually present as shallow groove (rarely absent or deep); antennal insertion hidden in dorsal view; supraocular line usually present to level above eye; vertex of head commonly with stridulatory file; pronotum usually not strongly constricted at base; anterior angles of pronotum poorly or well developed; anterior margin of pronotum usually serrate; pronotal pits usually present; procoxal cavity internally closed, usually open behind or closed by hypomeron, edge of hypomeron usually smooth; mesometaventral articulation, if present, dicondylic; width of mesoventral process usually less than coxa; submesocoxal lines usually absent; abdominal ventrites 1 and 2 usually free; abdominal calli present; metafurcal lamina usually absent with median stalk of metendosternite poorly or well developed; spermatheca rounded or elongate; apical pit of spermatheca usually absent; accessory gland of spermatheca usually present; tarsomere 1 usually longer than tarsomere 2 and 3; tarsomere 4 usually exposed in ventral view; tarsal shelf of tarsomere 5 usually absent; empodium with one or two setae; elytral punctation striate or confused with scutellary striole absent; elytra usually narrowly explanate; hind with with radial cell and wedge cell absent. [L03] Leschen, R. A. B. 2003. Erotylidae (Insecta: Coleoptera: Cucujoidea): phylogeny and review. Fauna of New Zealand 47: 1–108.